The Vikings (6-2) will be challenged as they travel to Oakland (4-4) for a matchup with the Raiders. Daniel House previews the contest and provides his keys to victory. The Vikings (6-2) will be challenged as they travel to Oakland (4-4) for a matchup with the Raiders. That's right, the Raiders are playing meaningful football in November. They have a young nucleus of players that are meshing very well. In fact, much of the same can be said about this Vikings squad. 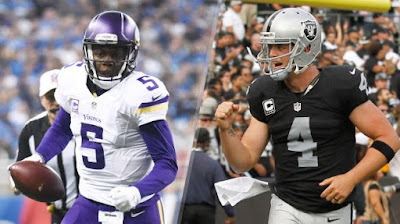 This matchup will be a clash between the 2014 quarterback draft class -- Teddy Bridgewater vs. Derek Carr. Both are doing some great things in their early careers. Carr has been playing behind a very solid offensive line and it's aided his numbers. He's completed 19 touchdown passes, while throwing just four interceptions. With weapons like Amari Cooper and Michael Crabtree at his disposal, he's used it to his advantage. Cooper has 653 receiving yards thus far and is making his case to be the NFL rookie of the year. His ability to run crisps routes and make plays after the catch are unparalleled for a player his age. As for Crabtree, he's played at a much higher level than anyone anticipated. He's exceeded 100 yards receiving twice, while adding three touchdowns over the last two contests. Not to mention, running back Latavius Murray has been running the ball well and is averaging 4.8 yards per carry. He suffered a concussion last week, but is listed as probable for this game. Finally, the Raiders have scored over 34 points in three consecutive games for the first time since 1995. Minnesota is the only team in the league to hold their opponents to under 23 points per game. Nonetheless, Oakland has an offensive attack and the Vikings need to be ready to handle this. Minnesota squeaked out a win against St. Louis last week, but will need to perform their best on both sides of the ball to pick up a road win over the Raiders. The Raiders have allowed the fourth-most total yards to opposing offenses. More importantly, they surrendered a gargantuan 402 yards to the Steelers offense last week. This included a mind-boggling 284 to wide receiver Antonio Brown. The Vikings have had problems getting their passing game going this season. Nonetheless, this is the perfect chance for them to have success through air. Mike Zimmer said this week it is very important to start throwing the ball better in these games. Teddy Bridgewater is expected to play after suffering a concussion last week. Connecting with his receivers on some of the easy routes will be necessary. Watch for wide receiver Jarius Wright tomorrow as he has a favorable matchup with cornerback D.J. Hayden. The Raiders have been without Nate Allen in the backend and this could help their secondary. However, the Vikings need to start scoring no matter what. It might take more than 24 points to beat the Raiders on Sunday. Sustaining drives and connecting on the quick throws to move the chains are pivotal. The Vikings have left too many points on the field this year and they simply can't do that against Oakland. The Vikings are going to be forced to win this game through the air. Minnesota has relied heavily on the legs of Adrian Peterson to support some of their offensive deficiencies. That won't work this week. The Raiders have surrendered the fifth-fewest rushing yards to opposing running backs. Stopping the run has been about the only effective aspect of the Oakland offense. The big key will be whether the Vikings can pass the ball. If they can, it will open up more lanes for Peterson to run. The box has been stacked for many of Peterson's run thus far. If this passing game can evolve to the point of being a threat, it will take the offense to the next level. Tomorrow is the day this needs to happen or the Vikings won't leave California victorious. The Raiders have tallied the fifth-fewest sacks of any team this season. However, I'm not ready to say their pass rush isn't formidable. Aldon Smith and Khalil Mack are both speed pass rushers and can get after the quarterback. The pass protection has been better over the last three weeks, but this matchup is no slouch. They have some high caliber pass rushers that can take over ball games if they can get going. Not allowing this to happen will be extremely vital to success. If Bridgewater has time to throw, the Vikings can take advantage of a poor Raiders secondary that has allowed a plethora of yards to opposing quarterbacks. When you are pressured on just 3% of your total drop backs, it's hard not to be effective as a quarterback. Derek Carr has had all day to step into the pocket and make throws. That extra time has resulted in a very competent passing game in Oakland. Former Vikings head coach Mike Tice really has the offensive line meshing well. They have surrendered the second-fewest sacks of any team. The Vikings have been causing so much havoc in the pass rush lately. They'll need to be creative to dial up pressure tactics that can get Carr distressed. Carr hasn't had to deal with this very much and it might be the difference to slow down this high powered offense. The Raiders have offensive weapons! Amari Cooper and Michael Crabtree have been a formidable one-two punch through the air. Cooper has over 653 yards receiving, while Crabtree has 591. Those are some pretty good numbers. Amari Cooper is a fantastic route runner and can make so many dynamic plays after the catch. Oakland has done plenty of short passing that has allowed him to flash this ability. Tackling well in the open field will be an absolute necessity. Anthony Barr (back) is questionable, but Eric Kendricks (ribs) is doubtful. Having one of these guys on the field is very important. Making those tough tackles in space are both fortes for each of them. Finally, Xavier Rhodes won't be able to shadow one receiver this week. Terence Newman will have to fully handle the responsibilities of covering Michael Crabtree. This hasn't been necessary at any point this season and might cause some headaches in the secondary. Hope they utilize Waynes more in this game. Not sold on Newman the last couple games. Haha yeah I felt pretty stupid saying that after the game.